Burgundy is an extremely popular color for box braids. It’s the perfect shade for those who want something in the red family that’s not too bright. Burgundy is a color that compliments all skin tones and there are several shades of burgundy to choose from. You can opt for a rich, deep Merlot hue with strong purple undertones, or go with a lighter shade that leans more towards red. Either way, it’s a great color choice that will surely turn heads. 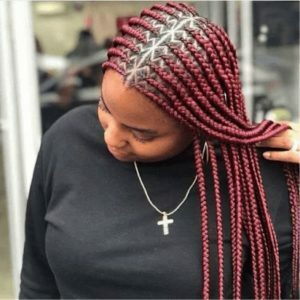 With all the different hues and braid sizes and lengths to choose from, there’s sure to be a burgundy box braids style that suits your taste. Here are 30 great styles for burgundy box braids. 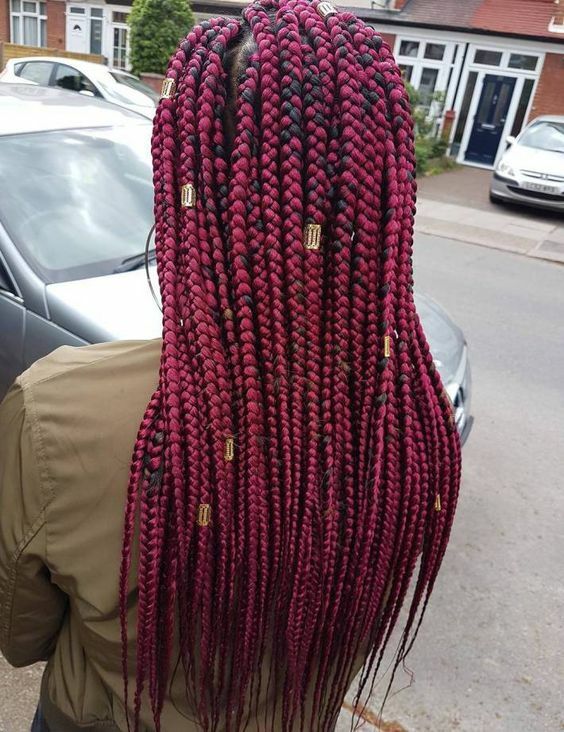 These pretty burgundy braids are about the size of a pencil – one of the most popular sizes for box braids. 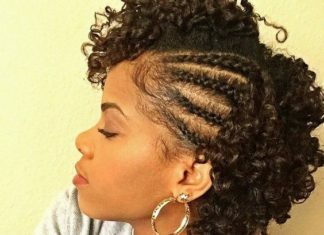 There’s no limit to the ways you can style these braids. 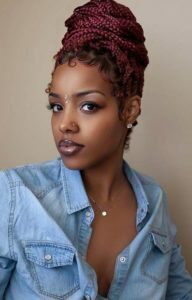 They look equally as cute when worn down, as pictured here, as they do when styled into a bun, chunky braid, or pigtails. These pretty burgundy box braids are styled into a high bun. 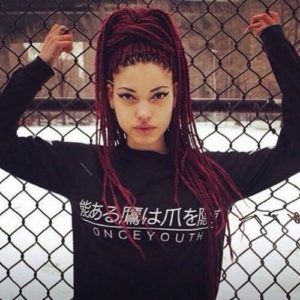 The braids are arranged and held into place with a bandana to create the illusion of bangs. 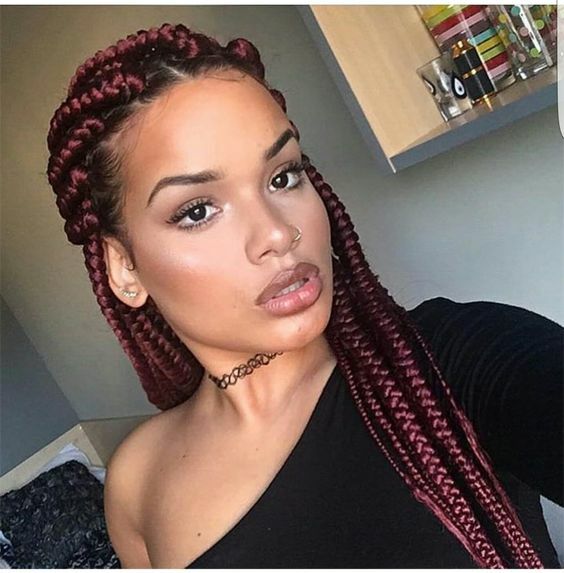 If you like chunkier braids, then these gorgeous chunky burgundy box braids are right up your alley. In general, chunkier braids tend to put less tension on your scalp, which is a definite benefit when it comes to preventing breakage and other types of damage. You can never go wrong with a high ponytail. These cute burgundy box braids look great styled into a simple high pony, and this style only take a couple of minutes to create. 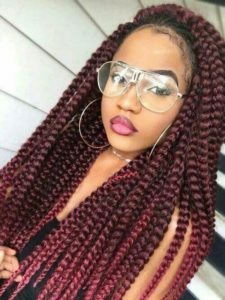 These eyecatching burgundy box braids fall somewhere in between pencil-sized braids and chunky braids. Pair them with a wine-colored lip or a more neutral shade. Either way, the vibrant burgundy color is sure to pop. For this style, these pretty burgundy box braids are pulled up into a high ponytail and adorned with gold beads for an added touch of elegance. 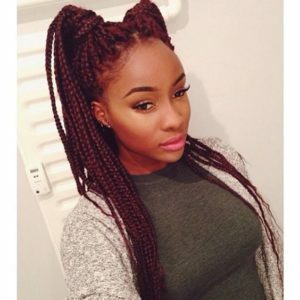 One easy and chic way to style your box braids is to wear them swept to one side of the head. 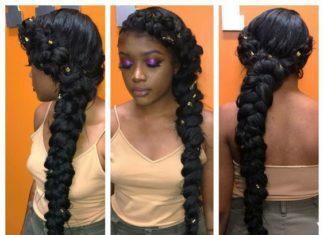 You can even arrange the braids into a side ponytail or into one long braid that hangs over one shoulder. These burgundy box braids are styled into two high pigtails for a fun, youthful look. 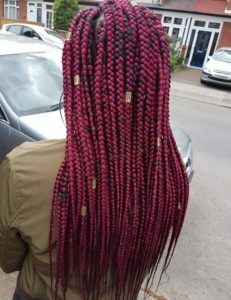 You can help hold the pigtails in place by wrapping a few of the braids around them. 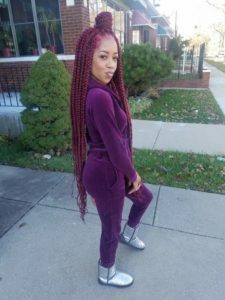 These pretty ombre burgundy box braids have hints of orange at the ends, making them a great option for those who want a look that’s a little more uncommon. This is also a great way to add a sun-kissed effect to a darker color like burgundy. 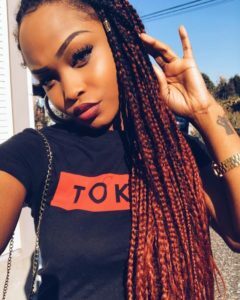 This is a simple but cute way to style box braids. Just gather the braids in the front into a high bun and let the rest of the braids hang loose. 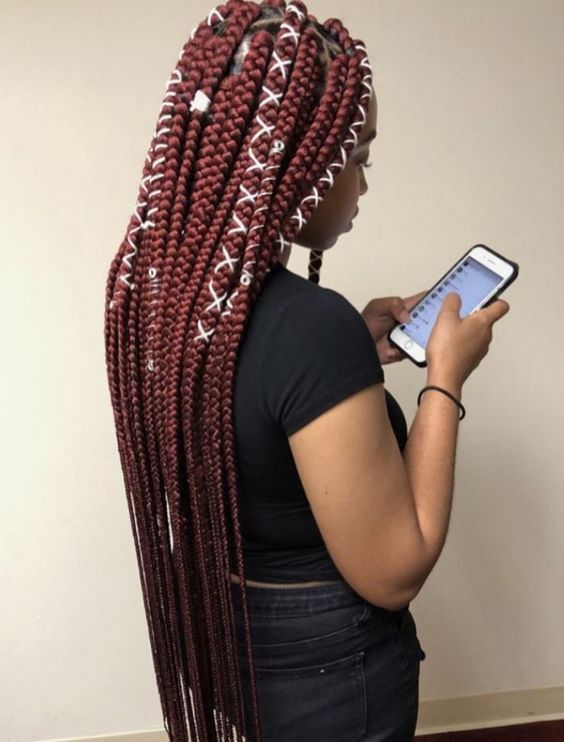 These ultra-long box braids are adorned with white cord, which really helps the rich burgundy color pop. 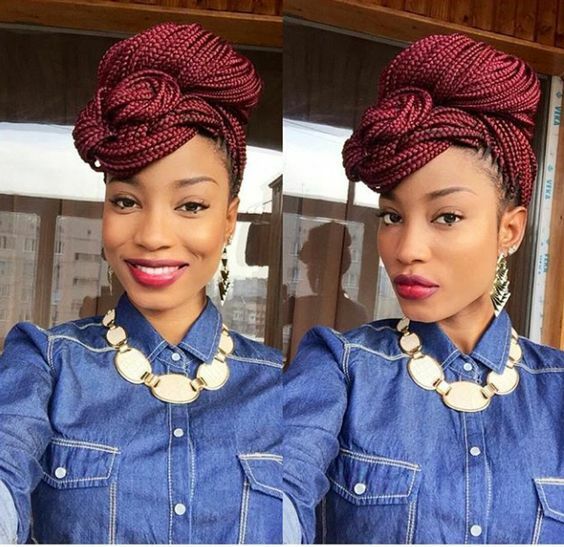 This is a great way to accessorize your box braids. 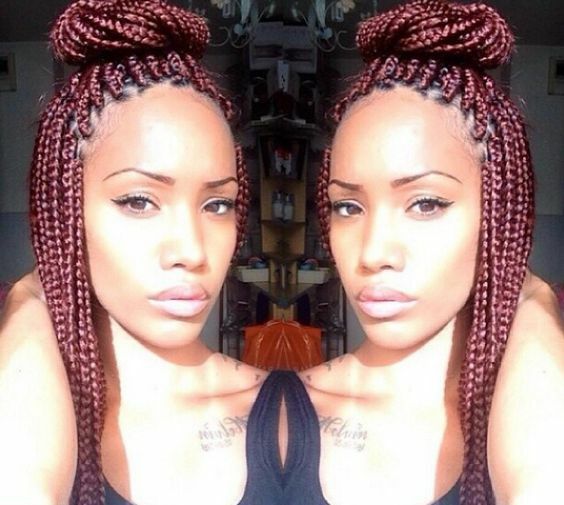 These gorgeous box braids have just the slightest hint of burgundy. 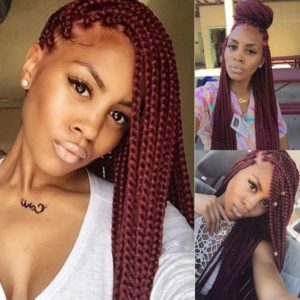 This subtle color choice is a great option for those who are hesitant about getting colored braids. Accessorize with some silver beads to finish off the look. 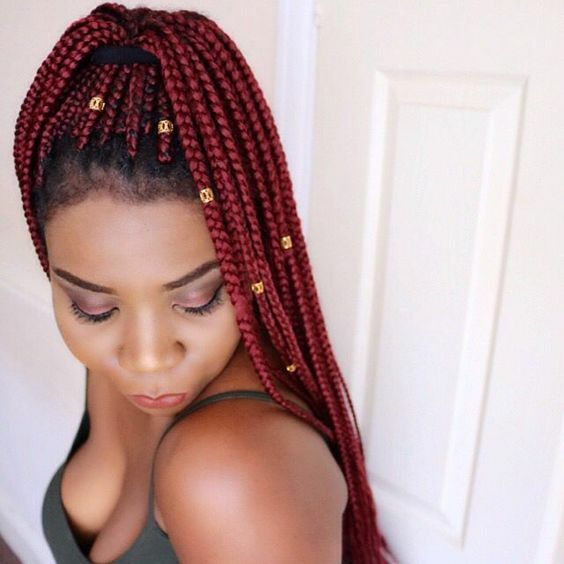 There’s something timeless about the look of extra chunky braids. 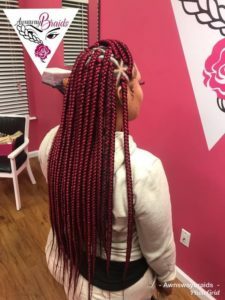 These beautiful burgundy box braids result in a great final look and as an added bonus, the installation process is much shorter than many other box braids styles. 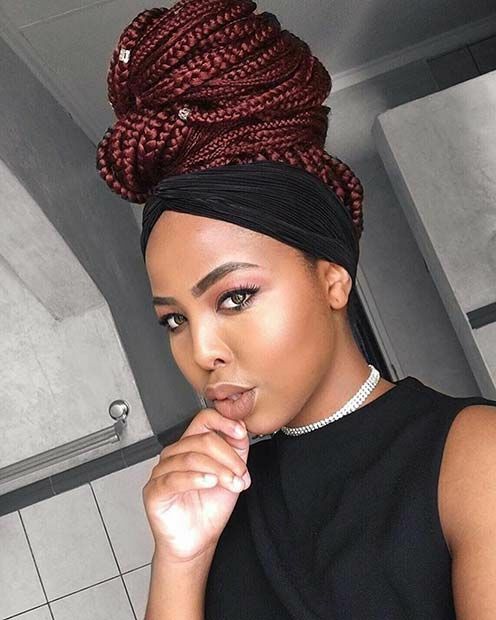 These thin burgundy box braids are carefully arranged and pinned into place to create a chic updo. 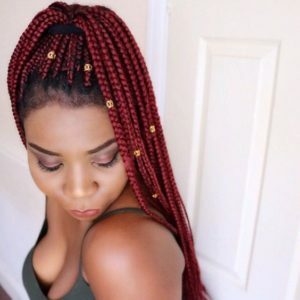 This is a great way to style box braids and the final look is one you don’t see everyday. 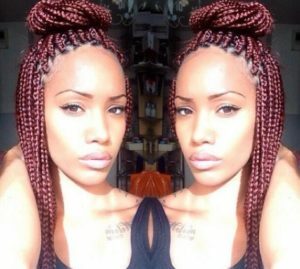 These pretty burgundy box braids are styled into a simple but cute half up high bun. 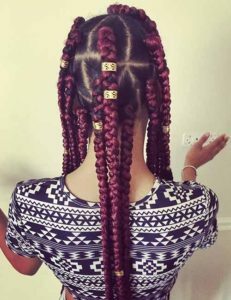 Just divide the braids in two sections and pile the braids in the front into a bun, leaving the rest of the braids to hang freely. 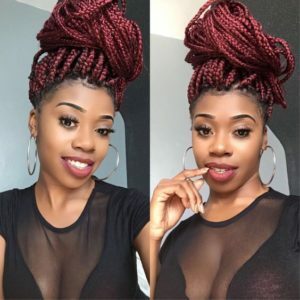 Here are three examples of ways you can style these beautiful burgundy box braids: swept over to one side, parted on one side and accessorized with beads, or in a half up half down bun. All three of these styles only take a few minutes to create, which means you can switch up your look every day if you want. 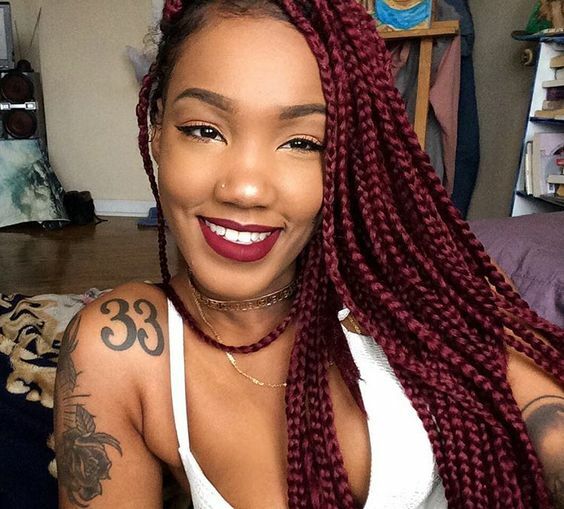 These ombre burgundy box braids are the perfect choice if you don’t want to commit to one color. 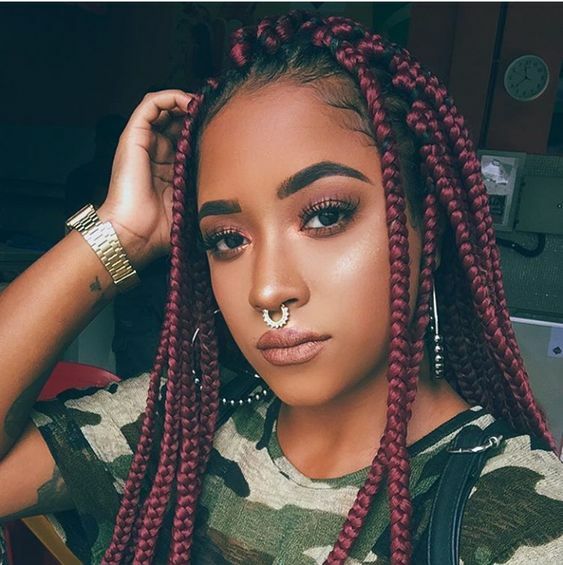 The ombre effect is much more subtle but it still allows you to play around with color: the perfect middle ground for someone who’s never switched up their hair color before. These bright chunky burgundy box braids look stunning pulled straight to the back. 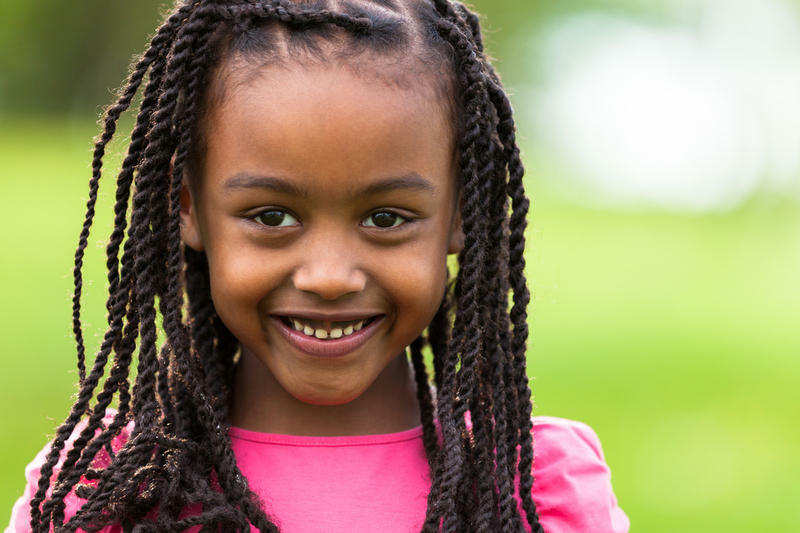 Secure the braids with a ponytail holder or clip to keep them in place. Choose braiding hair with the most sheen to replicate this look. These super long, chunky, burgundy box braids can be styled in a variety of ways. 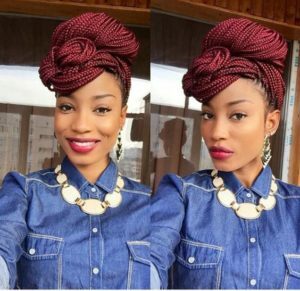 To achieve this look, take some of the braids in the front and wrap them into a cute topknot. 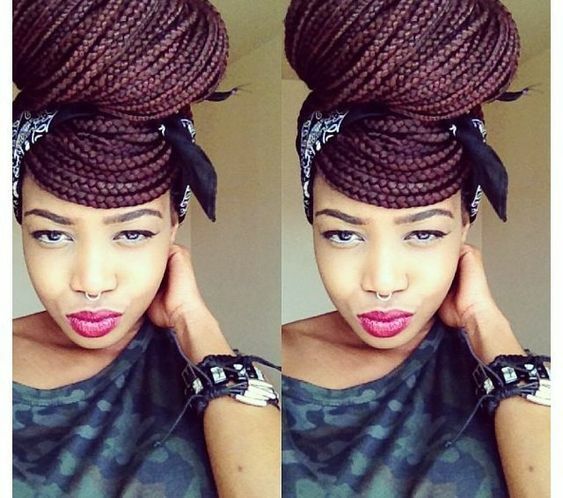 This is a great way to style your box braids. 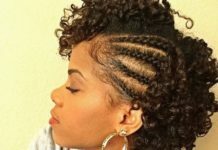 Updos help show off your face and help emphasize the color of your braids. For this look, the braids are piled and twisted up into a chic high bun and accessorized with a couple of silver beads and a headband. 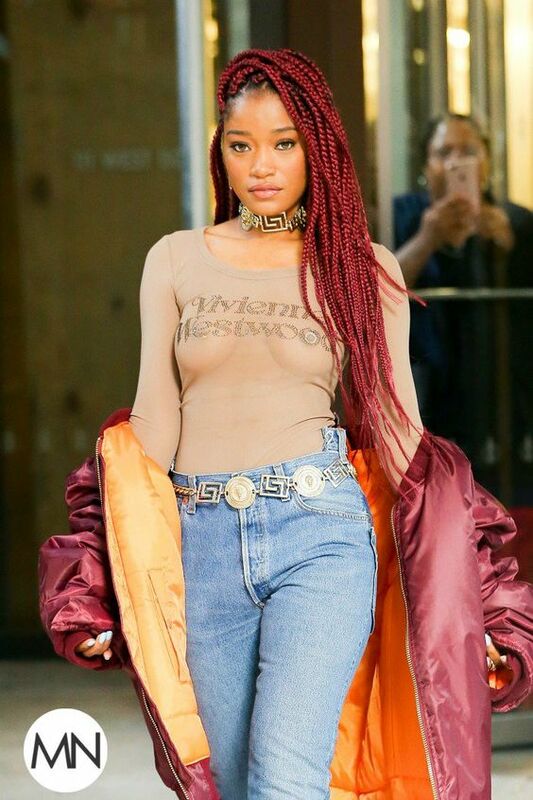 Keke Palmer’s gorgeous burgundy braids are about the size of a pencil, one of the most popular and classic sizes for box braids. 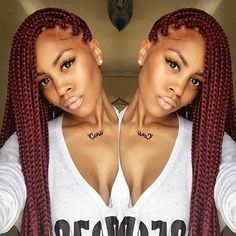 You can never go wrong with braids this size. 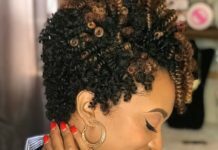 There are many ways you can style them, but the most timeless way to wear them is to simply let them hang loosely, partially swept to one side, as pictured here. 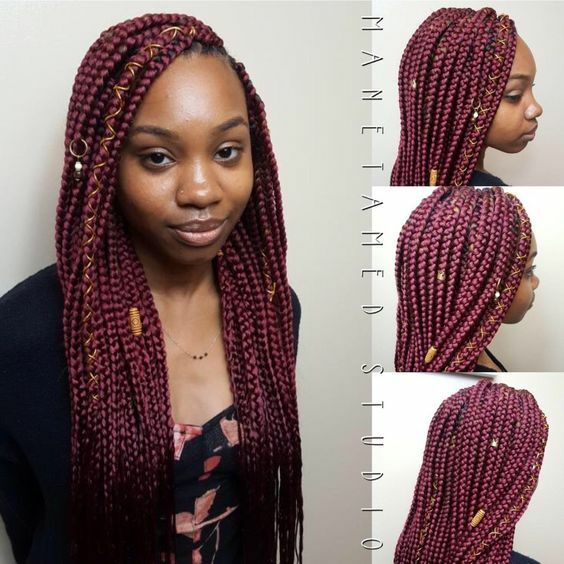 These long burgundy box braids are adorned with gold beads. Getting colored braids really helps emphasize the neat execution of this braiding technique. These pretty burgundy box braids are styled into a high bun. 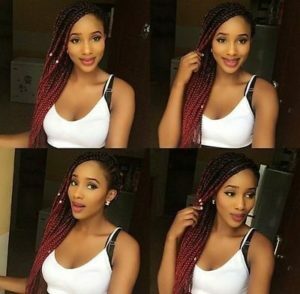 But what sets this style apart are the bangs, which are created by twisting some of the braids in the front into a bow shape. This is a truly unique way to style box braids. 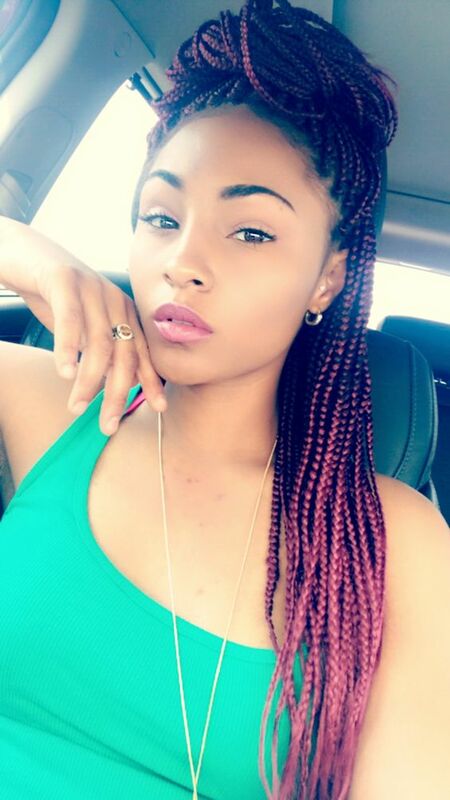 These beautiful burgundy box braids are adorned with several hair accessories, including wooden beads, copper-colored cord, and a hair ring. Using hair accessories is a great way to create a customized look that’s unique to your personal style. These burgundy box braids are about the size of a sharpie, a nice choice if you want braids that are just slightly larger than pencil-size. These braids feature triangle-shaped parts, which have become really popular over the years. With triangle box braids, you can also create cute designs with the parts, as pictured here. These pretty burgundy braids are styled into a cute high ponytail. 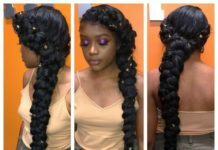 Some of the braids are wrapped around the ponytail for an added touch of detail, setting this style apart from other high ponytail styles. These slightly chunky burgundy box braids look absolutely beautiful. 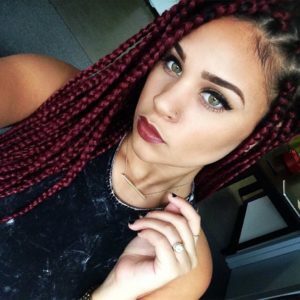 Kanekalon hair is typically your best bet if you want your braids to have that sleek, shiny look. 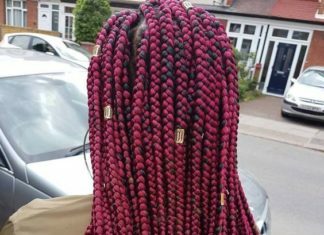 Not every style needs to be immaculate and precisely executed, especially when it comes to box braids. These pretty burgundy box braids are arranged into a messy high bun which is just as cute as more carefully arranged/neater buns. The great thing about a look like this is that it’ll look a little different every time you do it. Here’s a look you won’t see every day. 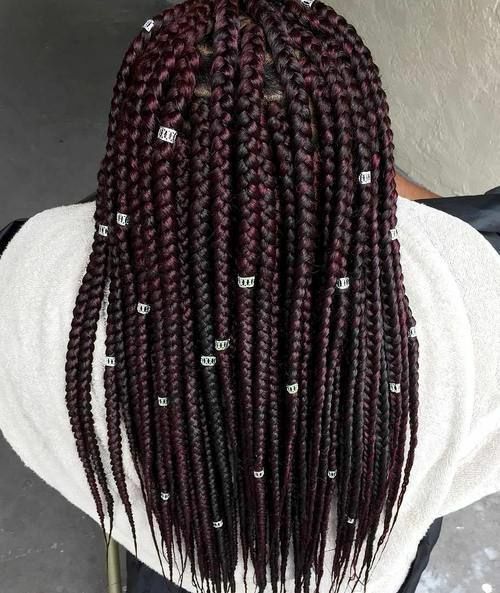 These lovely box braids are parted right down the middle and styled with precise, zig zag shaped parts. 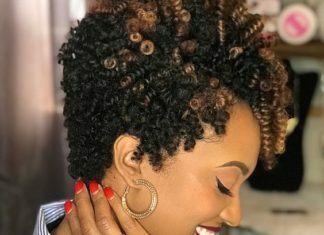 If you want a protective style that’s truly unique, this is a great choice. 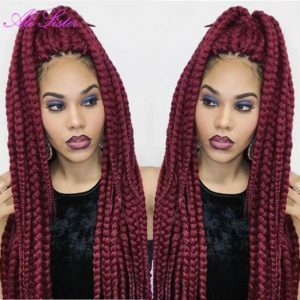 If you prefer chunky braids, then these ultra long wine color box braids may be just what you’re looking for. Wear them down or style them into a high ponytail, as pictured here. 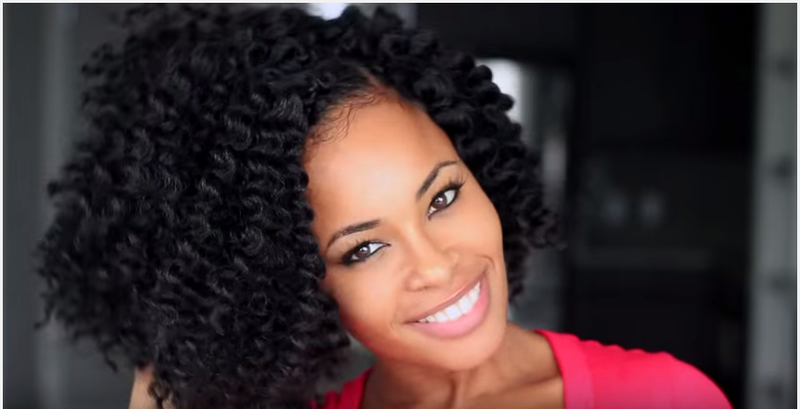 This look helps you keep the braids out of your eyes and frames the face nicely.